Search engine optimization is a powerful way to put your business in front of potential customers. But, for better or for worse, so-called “black hat” SEO has left a lot of business owners with a funny taste in their mouth. Keyword stuffing, buying links, and spammy guest posts are tactics of the past. Google has gotten smarter, and they don’t work anymore. But you still need to have SEO friendly content, right? How do you write keyword-rich content that doesn’t seem spammy to either people or search engines—but still appears in search results? You don’t want readers to be able to tell that you’re adding in keywords. This article will teach you how to ethically and not-spammily add keywords to your content—so smoothly that your readers won’t even realize. Even if blogging isn’t your full-time job, you can still pick up some quick SEO tips to make promoting your content easier. Start with keyword research before you actually write your content. Long-term SEO will often require making tweaks and updates to content to improve rankings—but it’s enormously easier to add keywords in your first draft than it is to edit them in later. So you’ll want to do the foundation of your keyword optimization the first time around. If you start your writing process with an outline, that’s a great time to do keyword research. You’ll have a good sense of your blog topic, and enough information to do good research—but it’s also early enough that you can pivot and add sections based on what research reveals. Actually doing keyword research isn’t the subject of this article—that’s its own potentially massive topic. This article is about how to use keywords once you find them. But I know that’s pretty unsatisfying, so here are two of my favorite guides on how to do keyword research. Both guides cover the fundamentals of keyword research (hint: target relevant, high volume, low competitiveness keywords). Both also walk you through exactly how to use specific keyword research tools to find the best keywords for your business and content. 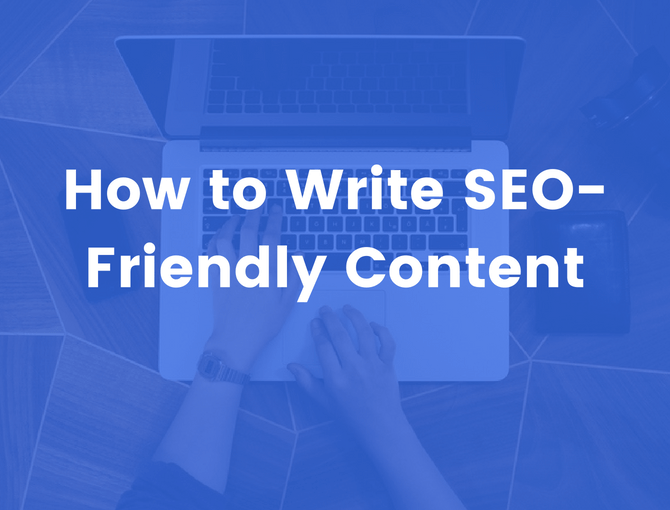 Right now, we want to know how to write SEO friendly content with the keywords we’ve gone out and researched. Keywords are more important in some areas of a blog post than others. Also, there are a few different kinds of keyword optimization you can do. Ok, now we’re getting into the meat of how to optimize articles and blog posts. We’re going to cover how to create keyword-rich content in two parts. First, we’re going to tackle the “standard” ways to use keywords in content. Then, we’re going to cover two ways to take your keyword optimization to the next level—and future-proof your blog posts against any future Google updates. Let’s dive in and learn how to optimize blog posts for SEO. Use your primary keyword in the URL of your blog posts. Honestly, this section could almost end with its headline. I’ve got two quick tips to add, and a warning. First, make your URLs short. The URL of this post is just /how-to-write-SEO-friendly-content/, not /how-to-write-SEO-friendly-content-that-generates-traffic/. Even that first URL is on the longer side. By the way, this includes minimizing the number of subfolders on your site. The URL of this post is not /blog/marketing/content-marketing/SEO/how-to-write-SEO-friendly-content/. Limit yourself on subfolders. Second, avoid adding numbers to your URLs. The blog post I wrote on the habits of highly productive people, for example, has the URL /habits-of-highly-productive-people/, not /18-habits-of-highly-productive-people/. What if you want to add more tips to your article later? Updating content for SEO is a great tactic, and adding a number to your URL makes it harder. Finally, a warning—your URL is hard to change. Once you’ve posted an article, changing your URL risks losing the SEO benefits of people linking to you. Get it right the first time. Your headline is the second most important place to add your main keyword, after your URL. Ideally, you would put your primary keyword towards the beginning of your title. Even if this is less important to Google than it used to be, people are more likely to actually click on your article if they can see that it mentions the keyword they searched for. Sometimes it’s hard to figure out how to use keywords in your headline. There’s a nice SEO headline formula that can help. As you might expect, this article ranks first for the phrase “What to Blog About.” If you head over to Orbit’s site, you’ll see that this phrase also appears in the URL. Notice the construction of the headline—it’s easy to turn into a formula. [Primary Keyword]: [Elaboration + Secondary Keyword]. Of course, this isn’t the only way to write a headline for SEO. But it’s a simple one that’s easy to use for most content topics. I’ll be honest. This is less important than it used to be. As Google gets smarter and smarter, it becomes less and less important to include a bunch of mentions of a specific keyword in your content. Having an “exact match” keyword on your page can help you signal what your content is about, but search engines are relying on exact-match keywords less than they used to. You can test this for yourself. If you google a phrase that’s longer than a few words, chances are good that Google will show you at least some content that doesn’t even have that phrase in the headline. It’s become smart enough to know that the content is relevant anyway. That said, SEO friendly content will usually mention the primary keyword at least a handful of times throughout its body text (see what I did there? SEO friendly content indeed). How important is it to optimize your images? Does alt text help SEO? If you aren’t actively doing image SEO, it’s probably only somewhat important. But it doesn’t take long, so it’s worth doing. That said, if you’re producing blog posts that include a lot of original design work, you probably want to invest some resources into image SEO. A lot of the time, Google image search results are less competitive than the standard “10 blue links” style search results page—for the simple reason that not as many people try to do image SEO. But if you’re using stock photography or other simple images, it’s probably enough to add a quick image alt text and make sure your image’s file name is descriptive and has a keyword. Remember—image alt text was originally intended to help people with disabilities. It’s fine, and even recommended, to include a keyword in alt text, but make the the text is actually relevant to the image. As an added note, it often makes sense to a caption to your images. Captions get read even by people who are just scanning body text, and can be a nice way to add a related keyword that you’ve been having trouble finding a place for. So far we’ve covered the basics of where to use keywords in your content. Now we can get to some of the more advanced stuff. Let’s start by talking about content length. “How many words should be in a blog post” might be the most common question asked by people who start blogging. If you trawl through the various content marketing experts, you’ll see a variety of opinions. Someone will inevitably mention Seth Godin, who has written a blog post every day—sometimes only a couple of sentences long—for the last who knows how many years. I’ve heard people say things like “you should never go over 500 words” and “no one reads long content.” These beliefs are common, but are they true? I’ll skip to the punchline: they aren’t. The most recent blogging study by Orbit Media Studios found that the average blog post is 1142 words long—and has increased in length every year since the study started in 2014. But wait, there’s more! Even though the average blog post hovers around 1000 words, bloggers whose average posts are over 2000 words report massively better content marketing success. 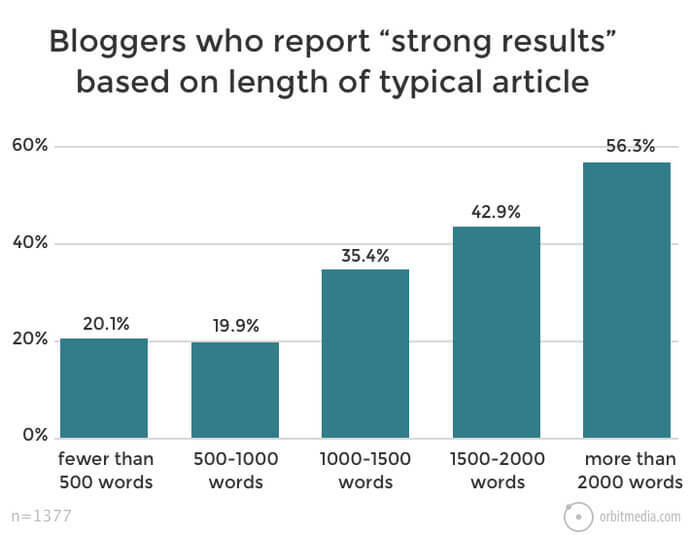 56.3% of bloggers that typically write 2000+ word blogs report “strong results”—compared to 20.1% of those writing fewer than 500 words and 35.4% of those writing 1000-1500 words. Does that mean that long blogs are always better? Not necessarily (insert Seth Godin reference here). But long blog posts do seem to at least correlate with success—especially SEO success. A 2016 study by Backlinko showed that the average result on the first page of Google has 1890 words—and I would expect that number to continue rising as Google places more emphasis on content quality. As long as you write blogs people love to read, people will read them (even if they’re long). It’s unlikely that Google uses simple “word count” as a ranking factor. But writing longer content gives you more chances to answer your audience’s questions. It lets you use more keywords. And it lets you use the next tactic we’re going to discuss. You can help your content rank better by answering more of your audience’s questions—even if they don’t specifically include your target keyword. Intuitively, this makes sense. Google doesn’t inherently care about how many times a keyword shows up on a page—it cares about showing people the best content. Plus, Google is better and better at figuring out which topics are related to each other. It can tell when you’re using a lot of phrases related to the overall topic of your post—which signals that your post is really relevant for that topic. This is a hard topic to cover in the abstract, so let’s jump right into an example of what this looks like in action. When I decided to write an article on what to do on your first day at the gym, I knew I had my work cut out for me. My personal blog is tiny. I only work on it about an hour a week, and its domain authority is low. Ranking for a hugely valuable phrase like “first day at the gym” would be really difficult, but I decided to go for it. I knew it would bring in a ton of traffic if it worked. Spoiler alert, it worked. My tiny site fluctuates between search position 3 and 5, smack dab in the middle of huge sites like bodybuilding.com and Men’s Fitness. Take a look at the table of contents of this article. Of 21 subheads, the primary keyword is in 3 of them (and honestly, I should probably take it out of one). 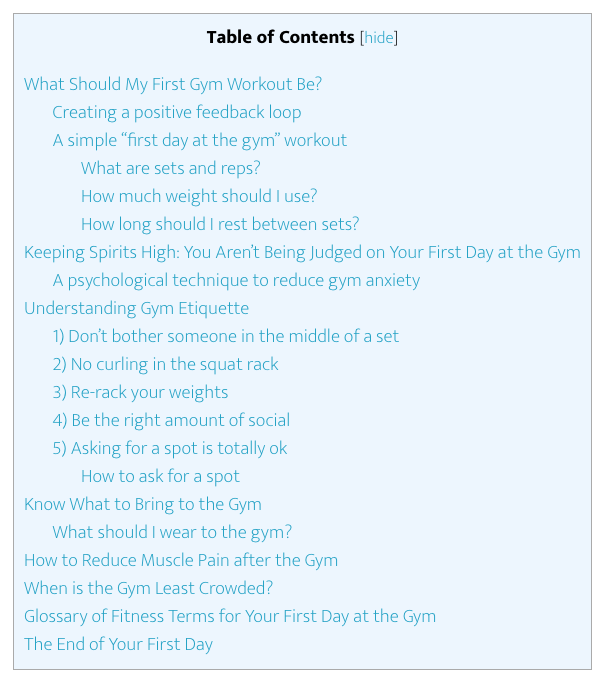 One other subhead has the keyword “first gym workout.” All of the other subheads answer other questions. But look at how many questions I’m answering! If you were going to the gym for the first time, wouldn’t you wonder what exercises to do, what weights to use, and how much rest to take between sets? Sure, and most articles on the subject will probably include that. But what about going a level deeper? Wouldn’t you wonder what you should wear to the gym? Wouldn’t you want to know the best time to go to the gym? Maybe you would worry about bothering people, being in the way, or asking for a spot. When you got super sore after your first workout, wouldn’t you be worried about injury, or at least be in need of a way to reduce that soreness? I tried to answer every question that someone could possibly ask. Where did I find all of these questions? Of course I had a sense of some of them based on experience—but the exact wording of the subheads comes from my keyword research on the subject. This article is almost 5000 words long. It ranks well. It’s both the most trafficked and the highest converting article on my site. Because I answered every question I could think of—and signaled relevance to Google. If you want to know how to optimize content for SEO—this is how! If you use tons of related phrases and answer every question that anyone could possibly have, your SEO is never going to feel spammy. It’s providing massive value to your audience. Want to do this yourself? The keyword research guides I linked to at the beginning of this article have some ways to find these types of questions. I also really love the think-outside-the-box tricks on finding related keywords in this blog post. A lot of writers are concerned that writing content for SEO is going to make their content seem spammy. But in reality, doing good SEO makes your content better! A lot of content marketing examples start with good SEO. Cover the basics of SEO by finding and using a primary keyword. Then, answer every question your audience has. Google will reward you.